Nature Abounds at Boulder Ridge Farm! Boulder Ridge Farm is 65 acres of private land less than two hours from New York City and located in beautiful Bucks County, Pennsylvania. There is a large pond loaded with fish, frogs, turtles and other wild life. Beautiful hiking trails into the forest. Outdoor barn with fire pit, patio over looking the pond, plus a comfy 6 bedroom 2.5 bath home. You can book directly by contacting us at the bottom of this page or through one of the below rental sites. 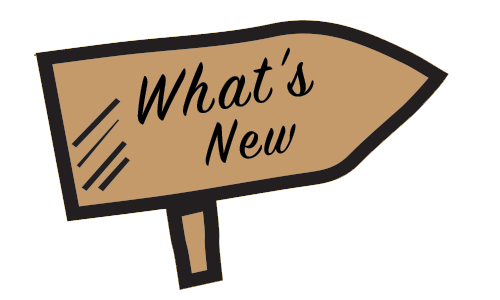 Please contact us to schedule an appointment, book a rental, schedule an event or anything else you'd like to know about us! This year we planted a small orchard! The trees are just babies right now, but eventually it will be a thriving area for peaches, apples, apricots, cherries and more ! 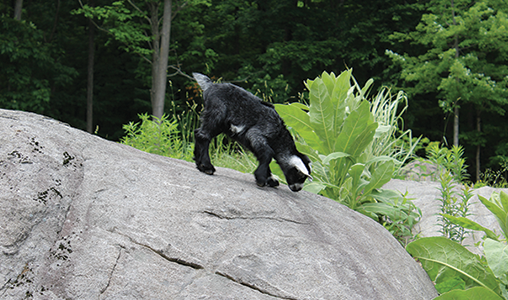 This past May, our goat Frieda, had a little baby boy, Pablo! 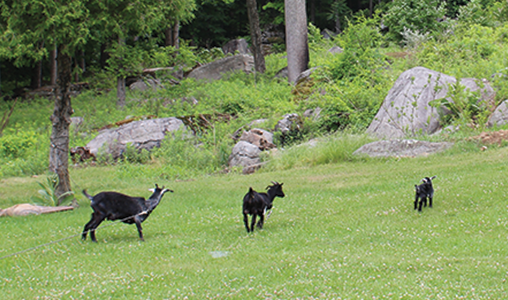 Now we have three goats on the property, Frieda, Diego, and little Pablo. Little Pablo having fun on the boulders. Frieda, Diego, and Pablo enjoying the outdoors.